This is probably will be My last generation Articulated Dragon which sum up each Features from my previous articulated dragon projects. 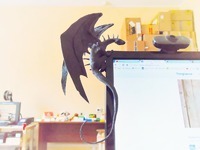 Speacial thank to the Dragonology by Mag-net for taking reference of general appearance of dragon. Special thanks to Bq-labs and their great Braq the dragon as i take reference for basic articulated dragon structure. As built to be Direct sequel to my first articulatd dragoness, this one was smaller and impoved flexibility on neck and belly and longer tail comprare to the older one. Size is About 320mm Long 160mm Height Without Wing length and 345mm Tall with Wing spreaded upward. This Dragon was built with 0.05mm Tolerance between the ball and the soket and and reused same size of soket and the ball on almost every joint except some ball joints in such as Finger claw and wing system. therefore if first one-two joints failed to assembled properly there will be failed happend again. please be careful. This model is hard to build as the Ball itself could break off in attempt to put parts together. *Cut out fabric with Template to make wing membrance. As i said before i put the Tolerance 0.05mm between the ball and the Soket but in my build, joints often loosed happend while i build this dragon so i apply thin liquid super glue on joints of course dryed enough to prevent weld joints together accidently. this treat did not exaclty solved the issue but it help some bit. even when i did't apply glue treats to compensate Tolerance to get tight joints, the joints was Very hard to put together and some time even break off the ball. and almost imposable to remove parts without dameging the ball on that part. i guess if print as lean part over 40 degree with Supports it shall help to increase the ball's strength like in my previous works. i had put conduit line to support string based assemble like common BJD doll but i have find it was almost useless as once parts assembled there was no way to separate parts to return through parts and it's hole itself cause weakend the ball's strength. The wing system was not so improved since they used on my Wym and as wing ever larger they often unable to stand posed as supposed to be and also unable to fold neatly as i hope for it. dragon was may not perfect and refined but i think i have reached my dream articulated dragon. i am unsure shall i tried next articulated dragon or not although i still have some unsatisfied points here and there and about wing but again i was deplated idea to build new dragon..